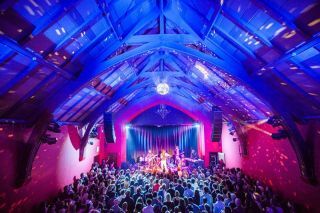 The Chapel is an historical landmark turned concert venue in San Francisco. Originally built in 1914, the 500 capacity main Chapel stage now hosts acts that run the gamut. The venue has undergone a complete sound and control system upgrade, with a total solution provided by QSC, including WideLine8 Series line array loudspeakers with WL212 subwoofers, K Series powered loudspeakers, PowerLight3 Series amplifiers and a Q-Sys audio video and control platform powered by a Core 500i processor. Adjoining the main Chapel concert room are several satellite areas including a mezzanine, restaurant, and patio, so the mission was twofold: to provide pristine and punchy sound reinforcement for the main room while playing the same or different music in other spaces at lower volumes. The main concert room features 18 WideLine 8 line array loudspeakers and six WL212 subwoofers, all powered with the PowerLight 3 amplifiers. Additionally, eight monitor mixes feed seven legacy Concert Stage Monitor CSM12 wedges plus one CSM15 for the drummer (all PL3-powered) with numerous K Series powered loudspeakers as stage fills and on the mezzanine. Tuning the entire system to the room is a legacy RAVE 522ua, managing graphic and parametric EQ, compression and limiting, and much more. In turn, it feeds a legacy, eight-output SC28 crossover. Audio distribution to a plethora of QSC loudspeakers in The Chapel’s other rooms is accomplished by the Q-SYS platform under the control of a Core 500i processor.